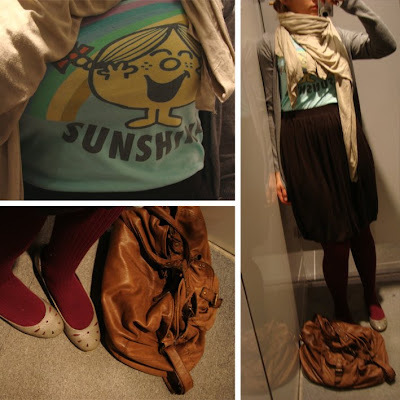 Fashion Architect: Little miss sunshine, not. I think the graphic tee, skirt & bright tights combo is anything but boring. Your uniform-outfit is so much better than mine! the skirt makes it so stylish! I love how you mix all these colours and still manage to make them work! The tee is definetely a winner. hopefully you'll be able to post. Nice flats and tights. i actually love that outfit. And the bag! You're still adorable, lady. Always.